Never Enough Nails: SinfulColors Holiday Tinsel collection Brings the Bling! SinfulColors Holiday Tinsel collection Brings the Bling! Today I have two polishes from the SinfulColors Holiday Tinsel collection, a small collection of 6 bar glitter toppers. First up is SinfulColors Spiked Ice, a clear base packed with shiny black bar glitter. The glitter pieces are very reflective looking, as you can see in the pictures. They aren't like a flat black. I usually am not a fan of bar glitter, but I really like the way this looks for some reason! These glitters all lay nice and flat too. 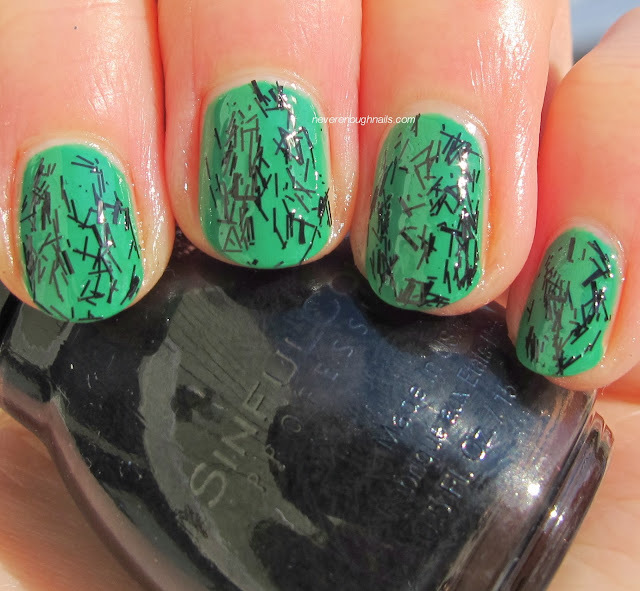 This is two coats of Spiked Ice over SinfulColors SinfulShine Rise & Shinier. I had no trouble applying this. Occasionally pieces of glitter would stick out over the edge of my nail, but I just pushed them back quickly before the polish dried. That is to be expected of a bar glitter polish though. SinfulColors Gold Tinsel is REALLY bling-y! Gold Tinsel is a mix of yellow gold and rose gold bar glitter in a clear base. It seems to be extra shimmery, and my camera kind of couldn't handle it in the sun. I like the mix of the two golds, it's more interesting than just plain gold bar glitter. 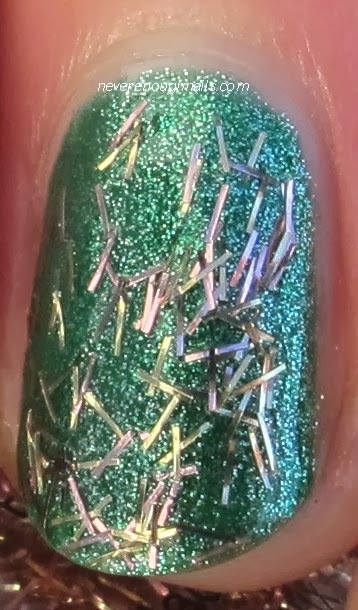 This is two coats of Gold Tinsel over SinfulColors Pine Away. Like Spiked Ice, it was easy to apply and I just had to push the occasional stray glitter back on to my nails. These glitters also lay nice and flat. The other four shades in this collection are Silver Rainbows (holo silver bar glitter), Pink Icicles (pink bar glitter), Cold As Ice ("winter white" bar glitter), and Tinsel Town (blue bar glitter). 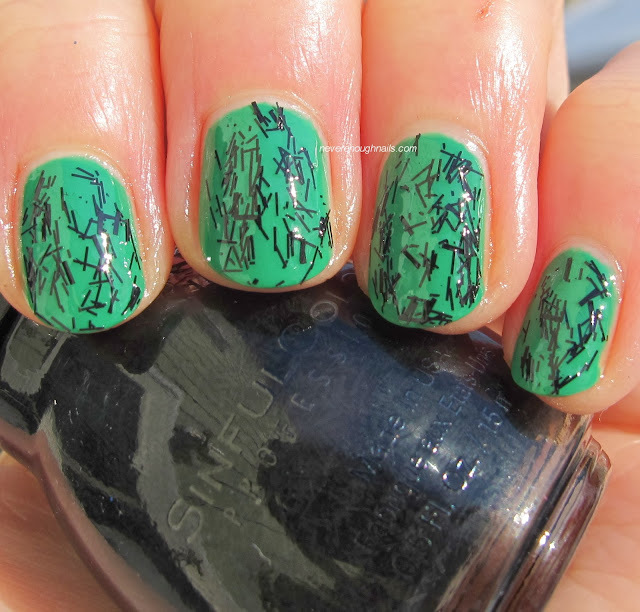 SinfulColors Holiday Tinsel is available exclusively at Walgreens!